As Vice President of Technology Innovation for Topgolf, Scott Lovejoy is responsible for leading the U.S. and U.K. Technology Innovation teams, overseeing venue and Home Office technology, applications, infrastructure, and support. Scott joined Topgolf in 2016 with a focus on scaling and growing Topgolf’s technology efforts while delivering excellent Guest and Associate experiences. 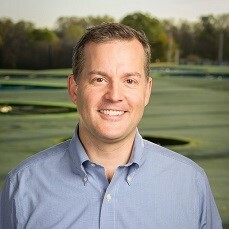 Prior to Topgolf, Scott served in various technology leadership roles with companies such as Sprint, Clearwire and WesTower. He is a graduate of Texas A&M University and earned a dual-degree MBA from Columbia University and the University of California at Berkeley. Scott lives in Dallas with his wife and son who share his knack for exploring. When he’s not geocaching, Scott can be found practicing his hidden talent: juggling.